If you’re unfamiliar with what the Shuttlebox system is, please first look at my initial redesign of this project HERE. In 2017, after a handful of years of SARL using my first redesigned controller, the researchers decided that they’d like to expand the features and capabilities of the Shuttlebox units. So with that, I was tasked with a second redesign of the PCBs while the mechanical aspects of the the units were also re-evaluated. As I’d gained a metric ton of PCB design and assembly experience in the time since making the first design, I’m much happier with this new revision over the one they’d previously been using. This project is still in progress for the time being. As you can see from the images above, I’ve assembled the first design and have minimal firmware proving that most of the hardware on board works. However, the unit has not yet been run through its full system tests yet. I want to be a bit more thorough with this board as they plan to make 50+ units to sit on floor to ceiling shelves in their behavior testing room once it’s ready for production. Hardware-wise, these new boards aren’t too different than the previous ones. 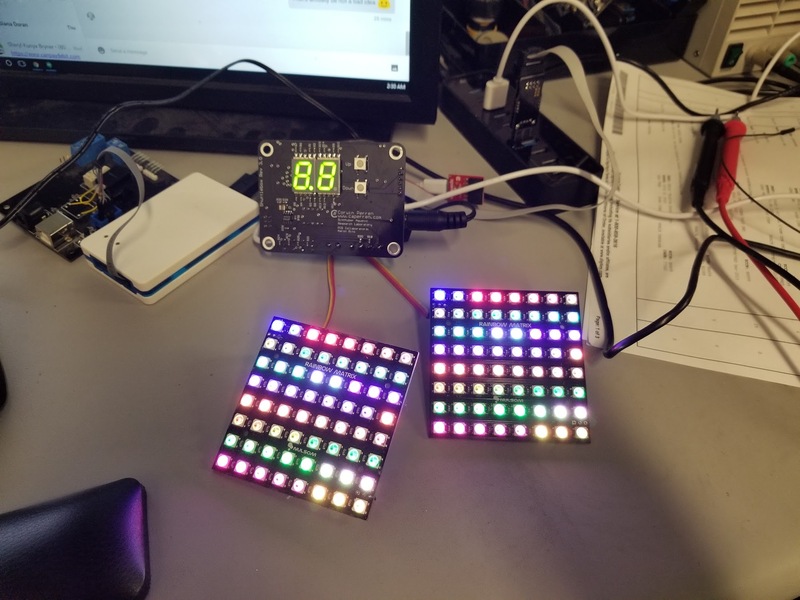 There’s still a 0-24V shock output, but with the addition of two 8x8 dot matrix RGB led panels for lighting up each side of the box. There’s also dual 7-segment displays on the front to set the box id number, which pairs with the custom mass control application that my coworked Aaron Rito wrote. This software will allow for the mass running on of the testing suites on all behavior boxes at once, from an easy to use GUI frontend. Check here in the future for more updates!